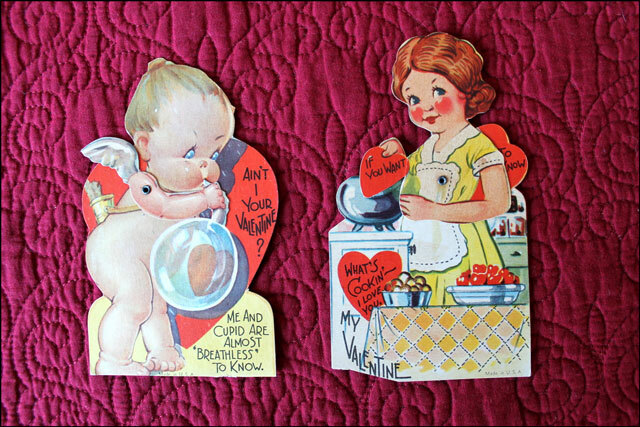 With today's post I was going to show you a selection of my favourite vintage valentine from my collection. But then I got side-tracked (and a bit obsessed) with this group of cards I bought as a lot from ebay a couple of weeks ago. I've mentioned before that what I particularly search out for my vintage stationery collection are unsigned pieces -- some collectors don't mind writing on them but my preference is for none. So, when I came across this lot of old Valentine cards for sale on eBay, with very little in way of description, I sent the vendor an email asking if the cards had been previously used. In response I got a very brief note saying that some of them had writing on them and some didn't, and that one of them had the year 1945 written on it. I was going to leave it at that and move along without bidding on them. 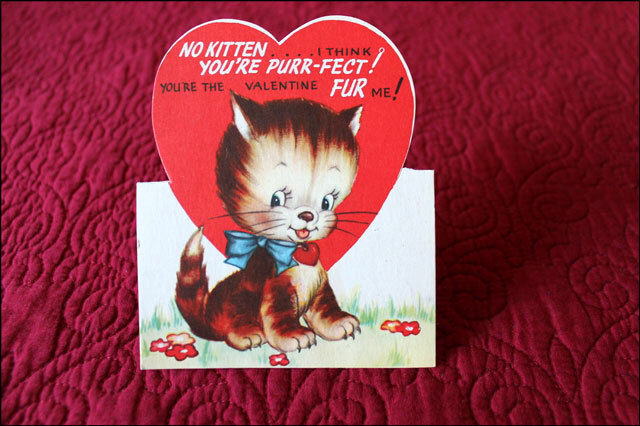 But, (and not to stereotype my cat-loving self), the kitten card had really gotten my attention. I considered writing again asking if there was writing on that specific one, but then thought this would probably be annoying, especially for such a small auction -- the beginning bid was only $7.50. So I decided to just bid the minimum amount for the 17 cards and if I won with that, I'd just enjoy them as they were, with or without writing. 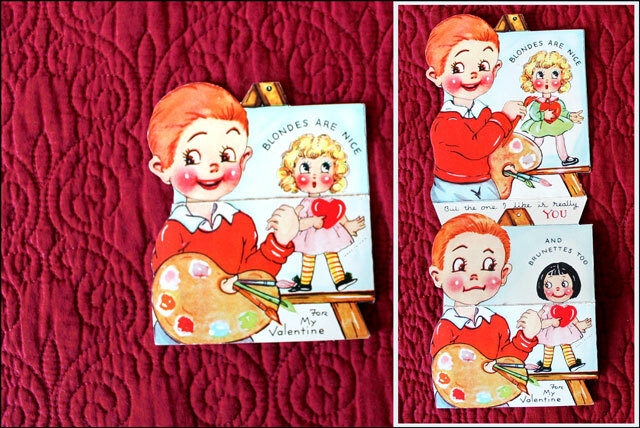 I could see that there were a couple of cards that are called 'articulated valentines'. These are ones with moving parts, attached by a rivet. These are quite rare and I had none of them in my collection yet, so wanted those. When they arrived in the mail a week later I was excited to see which ones had writing and which didn't. What I discovered was really interesting. There were actually two separate groups here. One set of 8 were all written on and they all had the same recipient on them. 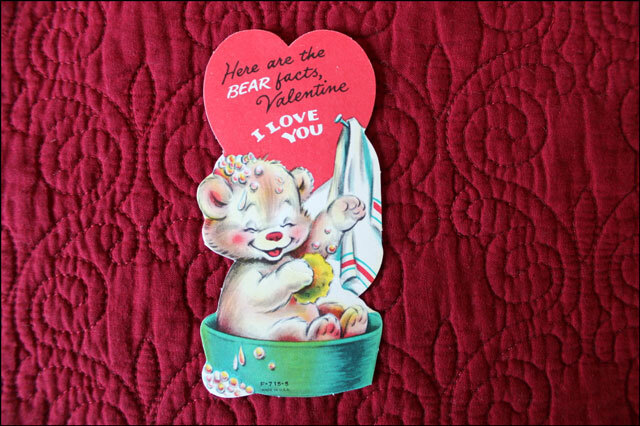 This was a pristine stack of Valentines that had been given in 1945 to a girl named Dorothy. The 2 articulated cards (directly below) were in this group, as was the kitten. Some of the cards had the girl's last name written on them, so out of curiosity I Googled her. The name was not a common one, so I found her pretty easily. She and her whole family was listed in the 1930 United States Census. 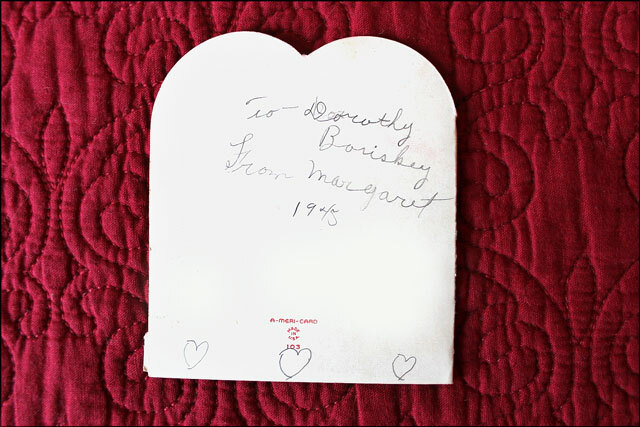 When she had received these she was a 12 year old girl living in a rural area in the state of Iowa. Her valentines had traveled 1292 kilometers (803 miles) and 68 years, to make it into my hands, here in Toronto in 2013. Dorothy is now an 80 year old married woman living in California. The census also reported the place that she had been registered so I searched it on GoogleMaps. I couldn't tell what her exact address had been but I knew that she had quite a few siblings, so the family would have lived in a large house. I concluded it could have been this one, or one very much like it down the road. I thought about putting the details online and offering to give these Valentines back to the family, but aside from not wanting to invade the privacy of an elderly lady, further research indicated that it is highly likely that it was her family who relinquished the cards to be sold in the first place. 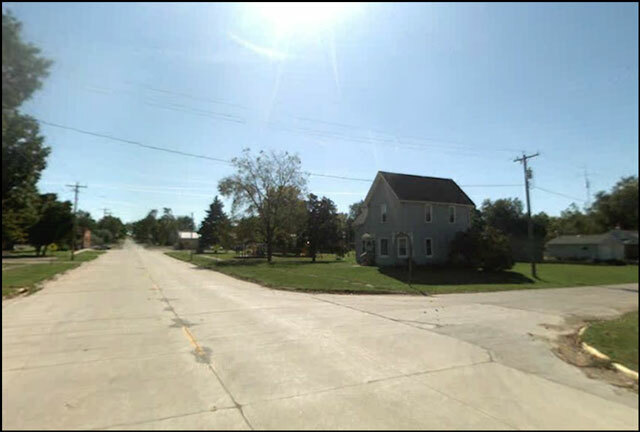 The person who sold them lived a couple of miles up the road from Dorothy's childhood home, in a small town there. I discovered that Dorothy's brother, who had stayed in the family home all his life, had recently passed away, so I am guessing that these cards were found undisturbed, where they'd been put back in 1945, when the estate was being cleared up. 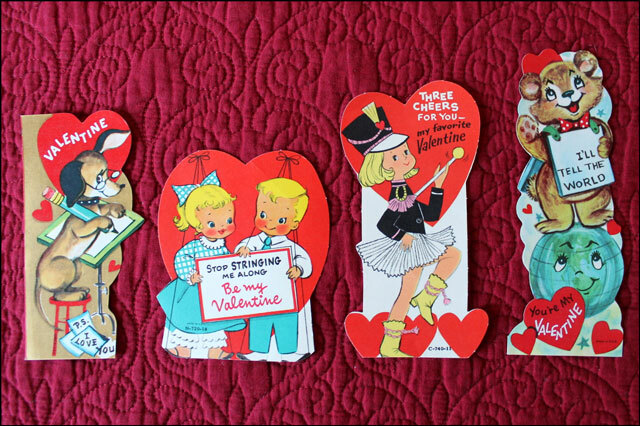 As for the remaining 8 valentines, they are all unsigned and in perfect condition and come from the 1960s by the look of the graphics. The person selling them must have grouped Dorothy's older ones with these others and sold them all together. 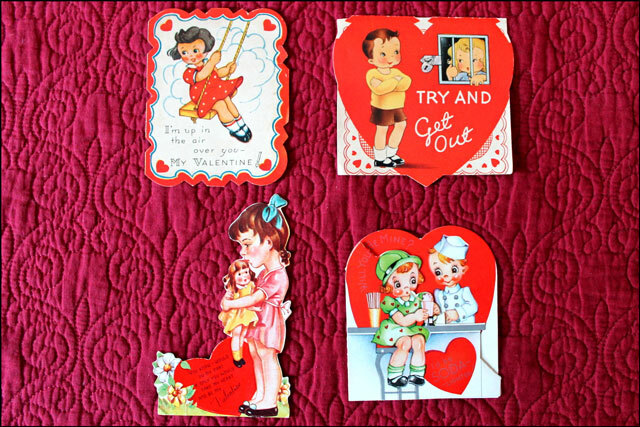 And the cherry on this vintage valentine tale is that there was a very special card included in this lot (if you can get more special than the Dorothy story?!). 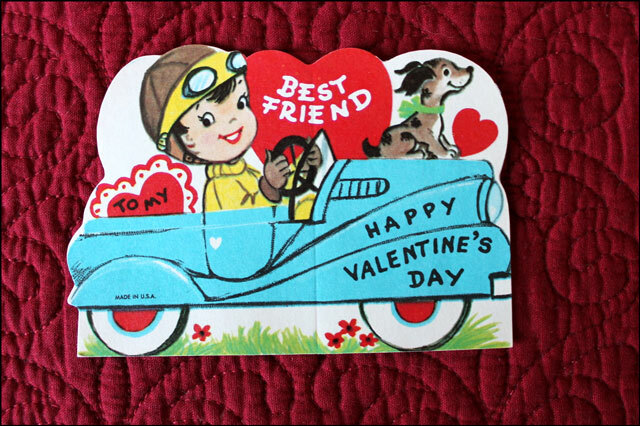 It is an Easter card in the same style as the 1945 valentines. I have never seen one. Vintage Easter cards are usually in the form of postcards, so this is a very treasured find! I'll wait until Easter to show it to you. Thanks for dropping over and happy Valentine's Day to you. I am cooking a (hopefully) nice dinner for Nick, so better get moving! These are incredible and such a bargain. How lovely to discover Dorothy’s story, too. Thanks Vix. Dinner is done now and it was fun. Hope you had a lovely evening too. Thanks Louise. Happy Valentine’s Day to you too. About the cards, I do like to save them and am very happy that they don’t take up much room! I guess one day I’ll have to give them away but I think I’ll probably do so as a collection keeping them all together. I wish there was a vintage paper museum that I could donate them to. 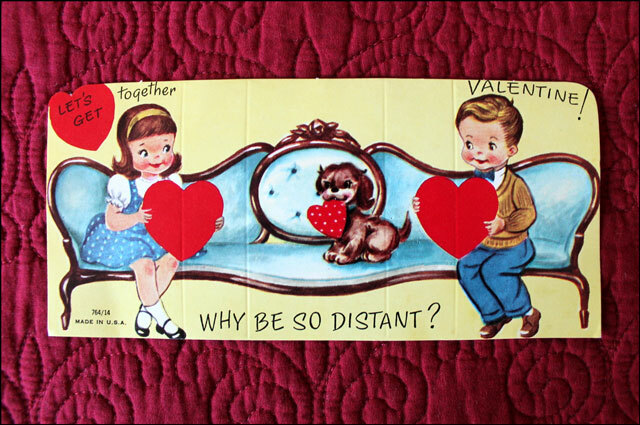 I must admit that I love these cards they are so romantic !! These are super cute cards! You really do your research Loulou! The story is great. I cannot believe how much info was available about Dorothy online.